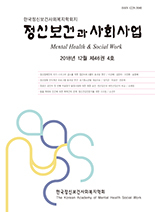 성준모,(2014).대학생의 스마트폰 중독에 영향을 미치는 스트레스 요인.정신보건과 사회사업,42(3),5-32. 본 연구의 목적은 대학생의 스마트폰 중독에 영향을 미치는 스트레스 요인들을 알아보고 사회적 지지와 자아존중감이 조절효과를 나타내는지 알아보고자 하는 것이다. 이를 위해 편의 표집방법으로 대학생 679명을 조사하였다. 분석 결과, 사회적 지지 조절효과 모형에서는 가족관계, 교수와의 관계, 장래, 가치관 등으로 인한 스트레스 요인이 스마트폰 중독에 영향을 미치는 것으로 나타났다. 대학생의 스트레스와 스마트폰 중독의 관계에서 사회적 지지의 조절효과는 이성 관계, 교수와의 관계, 경제적 스트레스와의 상호작용을 통해 나타났다. 자아존중감 조절효과 모형에서는 가족관계, 장래 등과 관련된 스트레스 요인, 자아존중감 등이 스마트폰 중독에 영향을 미치는 요인인 것으로 나타났다. 대학생의 스트레스와 스마트폰 중독의 관계에서 자아존중감의 조절효과는 이성 관계 스트레스, 교수와의 관계 스트레스, 경제적 스트레스, 가치관으로 인한 스트레스와의 상호 작용을 통해 나타났다. 이를 통해 대학생의 스마트폰 중독을 줄이거나 예방하기 위한 심리사회적 개입 방향을 제시하였다. The aim of this study is to identify the factors influencing smart phone addiction of university students, especially to examine how social support and self esteem have the moderating effects. The participants in this study collected 679 university students through convenience sampling. The results of analysis are as follows: In the first model, there was the effect of interpersonal stress(family, faculty) and task-related stress(future, value) on the smart phone addiction. Social support moderated on the relation between interpersonal stress(lover, faculty) and task-related stress(economical). In the second model, there was the effect of interpersonal stress(family), task-related stress(future) and self esteem on the smart phone addiction. Self esteem moderated on the relation between interpersonal stress(lover, faculty) and task-related stress(economical, value). The directions for psychosocial interventions for the smart phone addiction of university students were suggested.